Kindness activities teach students lessons in caring, empathy and good citizenship that will last a lifetime. Discuss with children the definition of kindness and the associated values (e.g., courtesy, respect, gentleness, helpfulness). Create a “Kindness Tree” and write these ideas on its leaves. Hold a Kindness Story Time, during which students and teachers can share experiences of kindness from their own lives. Talk about how being the giver and recipient of a kind act feels. Ask children to write a story or draw a picture of an event which they have experienced in which someone was kind to them. Have students create an alphabetical list of simple kind acts. 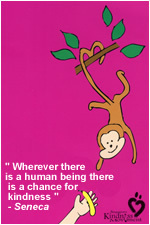 For example, “A: Be kind to Animals, B: Befriend a new student, C: Carry someone’s shopping …. Students can make Kindness Coupons for family and friends who can redeem them for help from the giver with housework, gardening, babysitting, etc. Choose a member of the school staff to be the recipient of special thank you notes from students on their own Appreciation Day. For example, students can make cards and drawings for a member of the catering or cleaning team, and perhaps include a small basket of sweets or flowers. Identify two or three prominent historical figures who are known for being kind, compassionate and generous. The students can read about these people and then discuss what they admire about them and their actions. Make a kindness quilt, as a group project, from either cloth or paper. On each of the panels write a word relating to kindness or put a picture of a kind act. The quilt can then be displayed in the classroom or in another area in the school.Make cards for a student who is away from school because of illness or any other reason where they might need extra support or encouragement. If the student is going to be away from school for a length of time, have the children in his or her class make an audiotape to send. The tape could include a song, a short story being read, news from the classroom, expressions of encouragement, etc. Ask the class what they think the child would appreciate most.Ask students to make a list of kind acts. This could include: remembering to say please and thank you, talking to a new pupil and including him or her in games, sharing sweets or snacks at playtime, offering to help at home with household tasks, reading to younger siblings, really listening when someone is talking, carrying someone’s shopping, helping a neighbour with gardening, helping a friend with homework or a computer project, putting away toys, putting rubbish in the bin, thanking the bus driver, raising money for a charity … see what else the kids can add to the list! Have the children keep a regular Kindness Journal with entries, in writing or with pictures, of all the kind acts which they have done. Ask students to find articles in newspapers and other publications about kind acts and kind people. These stories can be used as a basis for a group discussion about the benefits of kindness. Gather a collection of kindness stories from students, teachers and other members of the school staff. Publish and distribute the collection to the entire school. Talk with children about being kind to animals. Encourage them to tell stories about how they are kind to their pets. They can draw pictures of their pets, with a list of the ways they look after them. Make a Kindness Box, into which everyone can put suggestions for Kind Acts. The suggestions can be taken from the box and students can commit to putting them into action, either as a group or individually. Create a puppet show about kindness. This, of course, can include making the puppets, writing the script, planning the music, and performing. A small programme can be made to accompany the puppet show, with the names of all involved and with a few quotations about kindness and caring. These quotations can come from established sources or can be made up by the students themselves (e.g., “Kindness is ….”). Have a Kindness Poster Contest. The posters can be displayed in a prominent area in the school or even in a local community centre. Start a ribbon campaign and give out kindness ribbons to people who have done an act of kindness. Ask that person to give the ribbon to the next person they see do an act of kindness. Start a Kindness Club in which members will resolve to do one act of kindness each week. Keep a club journal, with stories and pictures, to share with others. Write a mission statement with goals, aims and objectives. Choose a name, logo, mascot or colour for the Club. Get creative! Create poems, raps, songs, skits, and / or plays about the importance of kindness and consideration. Maybe these could be performed at a school assembly! Encourage the school newsletter to include regular articles about kindness and kind acts. If there is no school newsletter, see if there is a bulletin board in a well-travelled area on which your class could post kindness stories. Have the students draw Kindness Buddy names and then do something kind for that person during the week. Create decorations or kind messages for a meal-delivery programme. Discuss playground safety and courtesy and the importance of remembering that games and sports are for fun and friendship. Talk about a character in a novel that the class has recently read. Ask the students to write a short paragraph or poem from the character’s point of view. Thinking about the character’s imagined hopes, fears and feelings can help students to enhance their own feelings of empathy and understanding. Have the children make “Kindness - Pass It On” cards which can be given to friends or family members who have done something kind. They can, in turn, pass the card along to someone else who has been kind. Discuss the importance of 'Kindness to Oneself' with your students, including eating healthily, getting sufficient sleep, exercising, spending time with friends and family, relaxation or ‘quiet’ time, and talking to someone they trust about their emotions. Encourage students to learn about jobs in the community that involve helping others. Discuss how these jobs benefit the community, why they think people do these jobs and whether or not they themselves would like to do similar work one day. Challenge students to see how many words they can find using the letters in ‘kindness.’ See if they can top the current record of 43 words! Ask the class to make a list of ways to save energy. Ask them to make a drawing depicting how being kind to the Earth is being kind to its inhabitants. Put up a sign designating a “Kindness Zone.” This can be in one classroom or can include the entire school building. Create a kindness slogan and put it on bookmarks to distribute throughout the school. Design a word search puzzle with words relating to kindness (caring, thoughtfulness, giving, friendship, love, sharing, helping, etc.). When the puzzle has been solved by the students, ask them to choose one of the words and talk about what it means to them. Challenge the class to see how many books they can find in the school library that contain stories about generosity, kindness, friendship, community involvement, animal welfare or respect for the environment. The kids could then choose one of the books, or an excerpt from one of the books, to read together and then discuss. Ask students to divide a page into 3 sections - Me / My Community / The Planet - and record ideas for acts of kindness for each. These ideas can be displayed on a board or in a booklet and new thoughts can be added over time. We would also love to hear about any additional kindness activities that you and your students have created!